Sugar did not experience the massive price spike in 2007-08 of other commodities, but has been making up for this with a tremendous increase in prices in 2009, driven by poor harvests in Brazil (the world’s largest producer) and strong import demand in India (the world’s largest importer). Raw sugar prices have risen from around 10 USc/lb in May 2008 to over 27 USc/lb currently, and market analysts expect further increases in the coming months. Despite the very tight global market, EU sugar beet supplies have moved in the opposite direction. 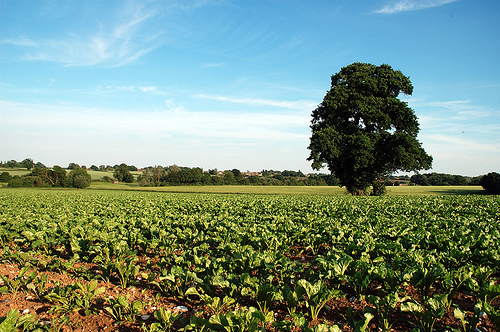 The EU expects a bumper sugar beet harvest this year, with beet yields among the best in years. Combined with imports from developing countries which now have free access to the EU market, the EU will have a considerable surplus over its domestic needs. However, exports are limited by a WTO ruling to 1.374 million tonnes, so the EU will be building carry-over stocks at a time of a significant global sugar deficit. Whether this is the case or not goes back to the basis for the WTO ruling on the complaint brought by Brazil, Australia and Thailand against the previous EU sugar policy. The WTO ruled that, despite the absence of explicit export refunds for over-quota EU sugar, over-quota sugar was effectively subsidised because it was being sold at less than average cost of production and was cross-subsidised by the higher price of quota sugar. The Bloomberg report quotes a number of UK agricultural economists who argue that because world prices are now above EU reference prices, then exports can be undertaken without subsidy and the export limits should not apply. The French Miniser for Agriculture has promised his country’s beet growers that he will raise with the Commission ways to avoid carrying over this year’s surplus into the following year. However, the EU spokesman points out that EU market prices are still above the world price (as is also seen in the diagram above, although EU prices are only published with a 3-month lag). Thus, even without an explicit export subsidy, other exporting countries may still be able to argue that additional EU exports are only possible because of cross-subsidisation. EU market prices have been falling, and this has consequences for those ACP developing country exporters which still benefit from a price guarantee on the EU market. Whereas ACP exporters were getting €512/tonne and €616/tonne for ACP raw and white sugars respectively in May 2007, these prices had fallen to €448/tonne and €517/tonne by September 2009 (EU sugar prices including ACP prices are reported on the EU Circa website). Some ACP exporters are now arguing that it does not pay in the short-term to export to Europe, so projected imports in the current year may be lower than expected.